What Is a Source Code Analyzer? The ability to assess an application’s source code is imperative to organizations, because it allows the early detection of errors or defects that can have detrimental effects on several IT areas. A development team typically performs two types of analysis when evaluating a program: static and dynamic. Dynamic testing involves the detection of issues within a compiled piece of software. Static testing is an assessment of the source code when the program is not in its executable form. Is your organization using static testing and analysis to evaluate raw code? Do current methods take too much time or have a human error margin that is affecting delivered results? Are unknown defects resulting in decreased performance or critical security issues? A source code analyzer is an automated solution designed to complete a static application assessment based on defined metrics for accurate, repeatable results. An automated solution makes it possible to assess raw code at any point of the development process. Source code analyzers decrease analysis time, remove the chance of human error, and provide a benchmarking measurement for continued monitoring of applications. If static testing is a difficult, time-consuming task for your development team, then a source code analyzer is a viable solution for gaining accurate analysis information in less time. What Does a Source Code Analyzer Do? A source code analyzer uses a defined unit of measurement to accurately assess a codebase. One of the most effective approaches involves defining each user requirement as a function point. This measurement is used to evaluate software quality, detect vulnerabilities, and monitor productivity based on the number of completed or required business functions. Organizations implementing software across complex, multi-tier infrastructures often miss critical vulnerabilities when performing manual source code assessments. Source code analyzers help organizations identify defects faster and implement specific efforts to boost security or meet compliance standards. CAST Application Intelligence Platform (AIP) is an automated source code analyzer designed for enterprise use across complex, multiple technology infrastructures. It can be used to complete an accurate, repeatable assessment of source code for each developed application. If static analysis is not being utilized or currently is a manual process, your organization could be missing out on several improvement opportunities. 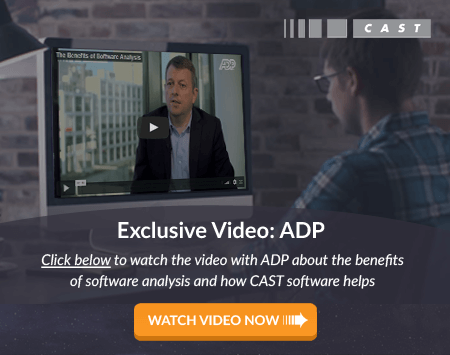 Click here to learn more about how automated analysis with CAST AIP can benefit your organization.